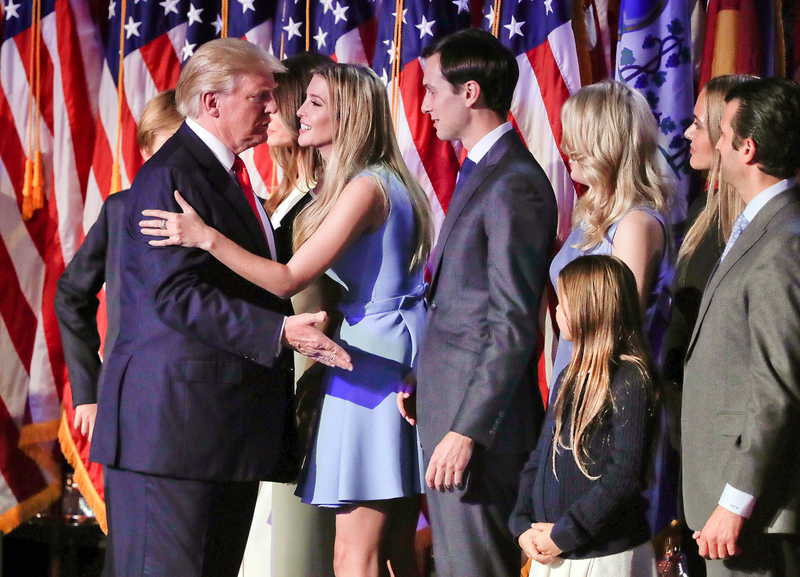 President elect Donald Trump (L) greets his daughter, Ivanka Trump, after giving his acceptance speech at an election night rally. Ivanka's husband Jared Kushner stands right next to her. Seeking contacts with U.S. President-elect Donald Trump, the Russian leadership has turned to its connections in Jewish business circles, Gazeta.ru has learned. Despite accusations of xenophobia, Trump maintains good relations with the Jewish community and intends to involve his son-in-law Jared Kushner in his administration. A high-ranking and well-informed source has told online Russian news publication Gazeta.ru that in their search for channels of communication with U.S. President-elect Donald Trump, Kremlin representatives have used members of Russia’s Jewish business circles who have contacts with the family of his daughter Ivanka’s husband Jared Kushner, an Orthodox Jew. In an interview with Gazeta.ru, the president of the Russian Jewish Congress, Yury Kanner, said he could neither confirm nor deny reports that the Kremlin had tried to establish communication with Trump via members of the Jewish business community. “Generally speaking, attempts to use representatives of global business, including Jewish business, are absolutely normal in this situation. I am convinced: Not only members of the Russian leadership are seeking contacts with Donald Trump,” he said. According to Kanner, following Trump’s victory in the U.S. presidential election, traditional political and diplomatic channels lost their relevance for a while: The elected American leader is a businessman and prior to the election campaign was not involved in politics. Kanner pointed out that the daughter of Trump’s rival Hillary Clinton has also converted to Judaism, but she is far more relaxed about observing religious traditions. It would appear that Hillary Clinton did not have too close links with the Jewish community either. “About seven years ago, when I just started working as president of the Russian Jewish Congress, we came up against a very serious problem. Singer Iosif Kobzon, a very important figure in the Russian Jewish community, had difficulty obtaining a U.S. visa,” said Kanner. “I got in touch with the president of the World Jewish Congress, Ron Lauder, a Republican and a member of a very respected American Jewish family. I asked for his help. Ron promised to discuss it with Hillary Clinton, who was U.S. Secretary of State at the time,” Kanner continued. Lauder had to wait for a month to hear back from Clinton, he went on. Trump enjoys far more support inside the Russian-language community in the U.S. than in the country’s Jewish community. Israeli pundit and former executive director of the Russian Jewish Congress Benny Briskin attributes this to the fact that the majority of former Soviet nationals are vehemently opposed to Democrats’ “liberal ideas.” Some of them also hope for an improvement in U.S.-Russian relations. “They believe that good relations between Israel, Russia and the U.S. are good for the global climate. Furthermore, many Russian-speaking Jews think that the main divide today lies not in relations between Russia and Ukraine but in the conflict between the Judeo-Christian and Islamic civilizations,” Briskin explained. That said, according to opinion polls, the majority of members of Jewish organizations voted for Hillary Clinton. A poll conducted by the GBA Strategies agency among American Jews showed that 68 percent of them intended to vote for the Democratic candidate and only 28 percent for Trump. During the 2012 presidential campaign, the allocation of votes was approximately the same: 68 percent for Obama and 31 percent for his Republican opponent Mitt Romney. Except that back then the election victory went to Obama, whereas this time, contrary to all opinion polls, it was Trump who won the White House. During the campaign, some Republicans who opposed Trump tried to persuade Jewish groups not to support the billionaire. AIPAC, which stands for the American Israel Public Affairs Committee, is a major Jewish lobby group. Representatives of this organization were indeed strongly opposed to Trump during the election campaign. In March, they even had to apologize for a speech Trump delivered at AIPAC, in which he yet again harshly criticized U.S. President Barack Obama’s policies. In the meantime, Jewish Republicans are pinning a lot of hope on Trump. Furthermore, many Middle Eastern commentators expect that Trump intends to 'Israelize' U.S. policy in the region.